1.0.1 Should you add texture in your designs? 1.0.2 What Is Actual Texture? 1.0.3 What Is Texture in Photographs? 1.0.4 What Is Simulated Texture? Do you want to create a real-life texture in your art? Perhaps add a certain feel and emotion in your work? Designers are getting very creative in terms of breathing life to their illustrations. Adding textures is one of the most effective and, therefore, used, technique to adding character to your illustration. Among the popular textures inspired by a material you commonly see around you is the plywood. Here’s an introduction to the delightful use of the plywood texture in creating designs. Looking to add texture to your designs? Perhaps a natural-looking visual element in your illustrations. Then you’ll love the plywood texture. Not totally sold on using this design element or perhaps any texture? In this article, we’ll tell you why it’s a crucial factor in improving the look and feel of your art. Should you add texture in your designs? Like in everything else, there are shortcuts to achieving your desired results when creating illustrations. You could be rooting for changes in perception, emotions, and a call to action. But you cannot achieve any or all of those if you present a flat graphic design. What’s the best way to do it? Add tones and textures. If you must add textures, you can do this manually. But it may require skill, dexterity, or expert knowledge of editing tools. Or you can take advantage of ready designs that you can automatically add as layers to your illustration. In this article, we’ll discuss these. 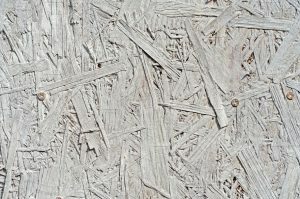 There are three types of textures used: actual texture, texture in photographs, and simulate texture. Actual texture means you can really feel the “weaving.” Letters have been traditionally woven on hard covers although the significance of the trend has dwindled down a bit. These days, designers add texture by using raised letters on soft cover books. If you’re going to use actual texture on business cards, you are dropping hints on the owner’s social status and taste. Use techniques like embossing, molding, or stamping to add texture to business cards. Lastly, you use actual texture on labels by using grainy paper stocks and embossing work. You want to add a distinct hand feel to your labels to imprint its uniqueness just be feel alone. What Is Texture in Photographs? Did your client or boss ask you to work on websites, posters, and layouts? Wherein thick paper or fabric is not involved. So how do you incorporate this design element? In this case, you evoke texture. You experiment with texture-heavy scenes. Try to add overlays of photos on texture-heavy scenes to reach your desired effects on websites. If you’re working with posters and magazines, you create contrasts between highly visual information and striking flat designs. You can also add textures on posters and magazines by adding photos of the human face. You can simulate texture by using sophisticated editing tools with the intention of replicating the look and feel of actual textures. Some techniques used to simulate texture include overlays, simulations, skeuomorphism, and texture type. You know plywood. You see it everywhere. It may have different textures as you see the telltale marks of wood imprinted on its flat surface. Wood grains have a quiet elegance to them. Regardless of how they slant or intercept, they always evoke a feeling of peace and calm. Maybe it’s the naturalness or the memories of how it feels like to commune with nature. Perhaps those are what makes the plywood texture a soothing solution to an otherwise sour mood. Do you see how goth tends to look bare? But its bareness paves the way for your creativity as graphic designer to flow freely. If you use the plywood texture on your image, you’re adding depth to it. You are adding a bit of heaviness so your other elements need to be light to balance the blackness. This plywood texture is available at $6. Again, focus on the grain if you’re looking at any wooden artwork. 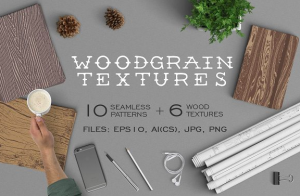 In this collection, you have 10 seamless patterns of wood and 6 simple wood textures for $10. Each design included in the set feels natural, which makes sense because it is inspired by nature. 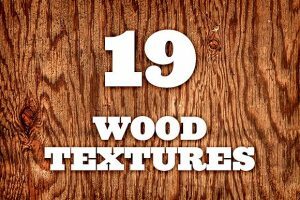 Create your own brands, wrappers, greeting cards, and cards and so on using the Woodgrain texture. These are vector designs, making them very flexible regardless of how they’re used. You can never go wrong with flowers on your projects and presentations. The great thing about the Flower Mockups pack is that you don’t need actual flowers to evoke the feeling/s you want. 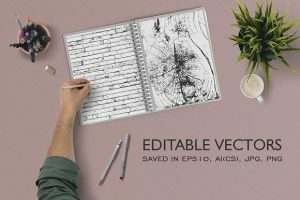 This is a set of pre-made themes and templates that you can readily use on your illustrations. Simply replace the design by dropping it inside the smart object layer, and don’t forget to hit Save! There over 200 items in this pack, each with professional photo shoots that feature great attention to even the smallest details. The assurance of high resolution allows for closeups and print. Go over the themes and templates included in this pack. Yyou will notice a smorgasbord of texture that range from marble and plywood to gold foil and pegboard. Don’t all these exciting features help squeeze out your creative juices? 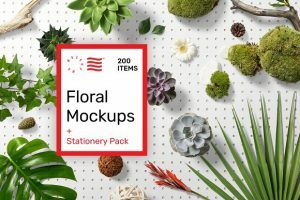 Use the Flower Mockup pack (which contains plywood texture) on your designs for only $39. 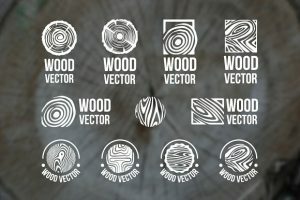 Stick to the basics and “truth” of wood by getting the Wood Textures Pack. 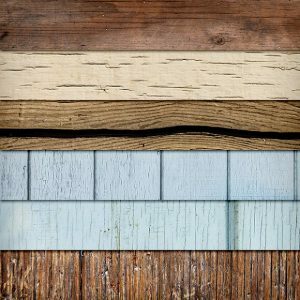 Instantly spruce up your designs by choosing from any one of the 19 high resolution textures included in this pack. Be warned, however, that these wood textures are non-tileable so you’ll have to find a way around it. Anyway, the entire beautiful set costs only $5. 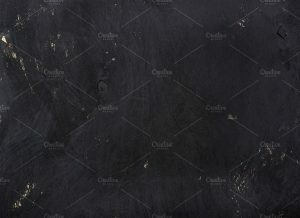 The chaotic appeal of this texture will definitely rock any design, and it’s only for $3! What luck! See the texture of each logo? They evoke different emotions and “feeling.” Use any of these logos to design interesting company logo or brand. Fuel your fire of passion with only $10. Reach out to use to learn usable tips and tricks that will surely help you up the ranks of respected graphic designers!